Seesaw is compatible with both Clojure 1.4, but will probably work fine with 1.3 and 1.5. Maybe even 1.2. This looks ambiguous to me. How about Clojure 1.8 1.9 etc.. The both in the first sentence looks not necessary.. Tried to use insecure HTTP repository without TLS. This is almost certainly a mistake; however in rare cases where it's intentional please see `lein help faq` for details. 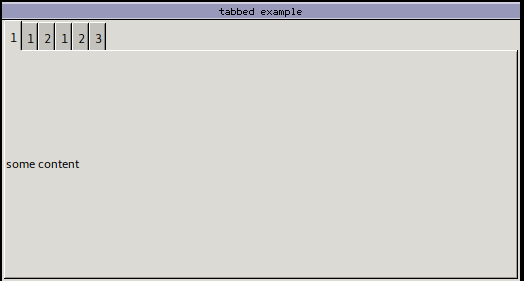 In this example, calling add-tab with 1 will see the tabbed pane update as expected. Calling it again with 2 will see the tabber with tabs 1, 1, 2. Calling it a third time will see tabs 1, 1, 2, 1, 2, 3. I've noticed this behaviour before with the tabbed panel outside of binds so I think it has something to do with how :tabs has been implemented. The work around is to remove all tabs before updating, but I'm switching to binds as a more efficient update mechanism and this wholesale replacement of tabs is no better than what I already have. Any insight in to a more natural fix here? I'd be happy to provide a PR if I knew where in the codebase I should be looking. On the run, no time to elaborate, excuuuse meee. Thanks for Seesaw! It has saved me considerable pain in making quick desktop GUIs. It looks like the swingx initializer causes an exception on Windows 10 because of a hack to to tell the L&F manager to use a particular font: Caused by: java.lang.IllegalArgumentException: java.awt.Font[family=Segoe UI,name=Segoe UI,style=plain,size=12] must be a UIResource [...] at org.jdesktop.swingx.JXHeader.<clinit>(JXHeader.java:87) ... 56 common frames omitted I suspect, but have not verified, that updating to a later version of swingx (seesaw is currently using 1.6, but there's a 1.6.2 available) might fix this problem.